If you are lucky enough to be a frequent flyer and you own a watch then you will be accustomed to the process of adjusting the time on your watch each time you land in a different time zone. The Rolex watch we have chosen is perfect for jet setters because it offers the display of two time zones on one watch, which means you don’t have to chose between your local and home time zone or have the hassle of calculating the time difference in your head. The Rolex GMT-Master & GMT-Master II has a distinguishably coloured arrow-tipped hand which circles the dial once every 24 hours and reads the “home” time zone on the 24hour bezel. The other hour hand, as well as the minutes and seconds hand, reads the time zone in the country the wearer is visiting and can be easily adjusted by winding the crown at 3 o’clock. This watch has become so recognisable and iconic in its own right that many even purchase this watch purely for aesthetic reasons, without the intention of using the dual time zone feature. Click here to view our collection of Rolex GMT-MASTER watches available for sale. 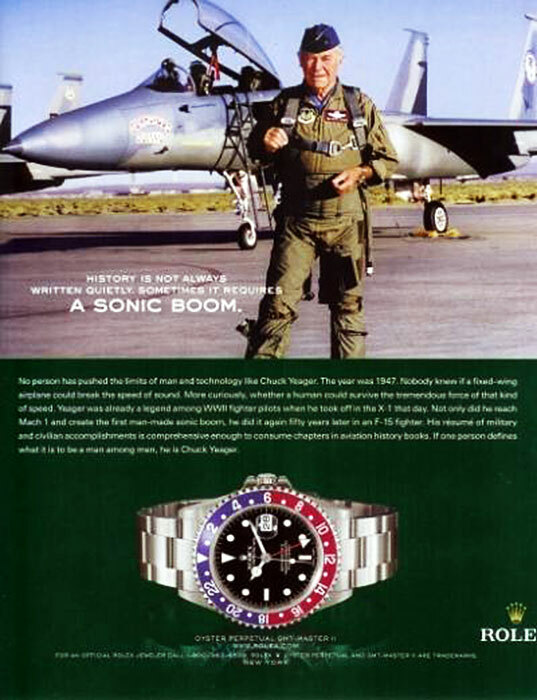 A vintage Rolex ad for the GMT-MASTER.